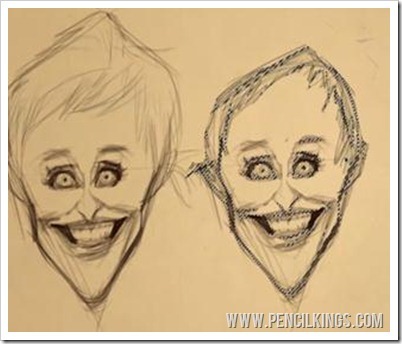 In the previous lessons, Sycra showed you the basics behind creating an awesome caricature. Now, he’s going to demonstrate how you can explore an infinite amount of possibilities for your artwork through a series of thumbnail sketches! As part of this process, you’ll be able to work out which elements work best in your drawing and how to develop these for inclusion in your finished piece. The thumbnail stage is one of the exciting parts of any project – it’s where you get to explore ideas quickly and experiment with drawing features to capture your subject’s personality perfectly. So, if you’re ready, pick up those pencils and graphics tablets and let’s get started! Thumbnail sketches are an incredibly useful way to work out elements of your drawing and then build upon these to create your finished caricature, yet this is an area that is often overlooked. In this lesson, you’ll learn how to play around with different ideas and become like a mad scientist – experimenting with different theories until you find a winning formula! 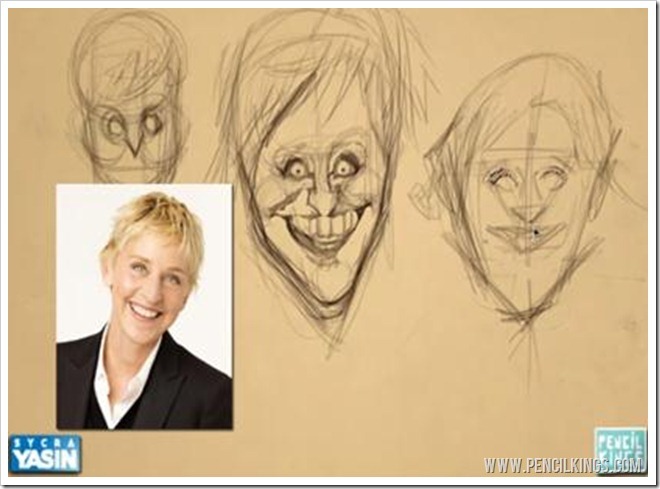 By exploring the different possibilities of what you can exaggerate, you can really push your designs and discover new exaggerations to make your caricature painting really stand out. Sycra often starts with a series of really rough thumbnails which he’ll then take elements from to begin work on his caricature. You can try the same thing, by taking photos of celebrities and just sketching out some ideas. Once Sycra has created a thumbnail that begins to achieve a likeness of his subject, he exaggerates this even more and pushes the features as far as he can. It’s amazing how even a simple sketch can start to look like someone and, once you found some elements which work for you, you’ll be able to develop these further. 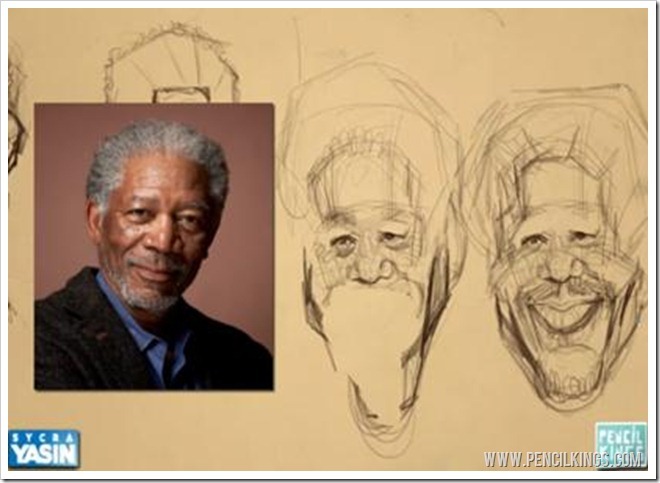 Keep going until you’ve found the ultimate likeness – the results of these early experiments will often surprise you! Giving yourself the freedom to explore many different possibilities is your ticket to creating the perfect caricature. One of the advantages of creating thumbnails digitally is that you can quickly duplicate elements of your sketches to use in others. To do this, select the Lasso Tool from your Toolbar and draw around the area you wish to duplicate. Once you’ve made your selection, you can hold down Ctrl + Alt to make a copy. In this example, Sycra duplicates Ellen’s face and tries out a different hairstyle. Don’t sweat it if you end up going back to your original example – trying out lots of variations is the best way to achieve the likeness you’re looking for. 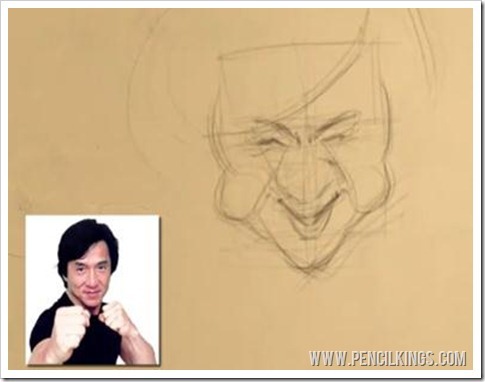 Try creating thumbnails of other famous faces to practise your caricaturing skills. 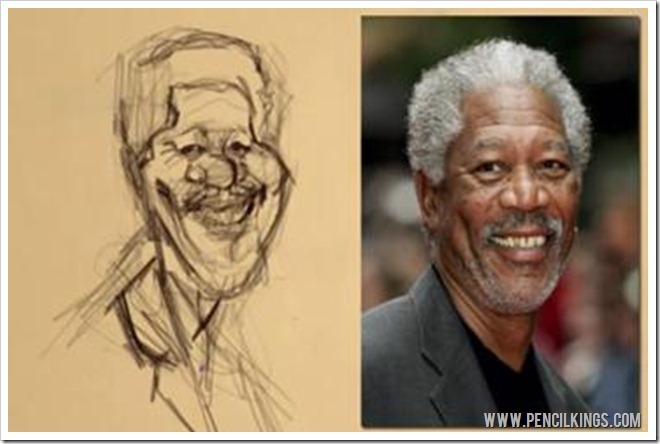 Here, Sycra has used different photos of actor Morgan Freeman to create a series of sketches which capture his personality. Try using photos taken from interesting angles – these can sometimes add an extra dimension to your caricature and throw up other interesting possibilities. You can sketch as roughly as you like at this stage – you’re not trying to impress anyone with your drawing skills, you’re simply trying to work out what will look best in your finished painting. Remember to include the body too, as this will also be important in your final caricature. If using traditional media such as pencils and pens, it’s a good idea to draw lots of variations based on your thumbnail sketches. Each way of working has its pros and cons and, while it may be easier to delete or duplicate elements quickly when working digitally, you may find it easier to sketch ideas out using good old-fashioned graphite! When working on your thumbnails, try and establish the more prominent features – are they the eyes, the forehead the ears or the nose? In Morgan Freeman’s case, Sycra decides to make the nose larger and plays around with the relationship between the chin and the forehead. Sometimes, it’s even worth doing the opposite of what you can see just to discover how this affects the rest of your drawing. Thumbnails are all about trial and error, so go ahead, have fun and experiment! 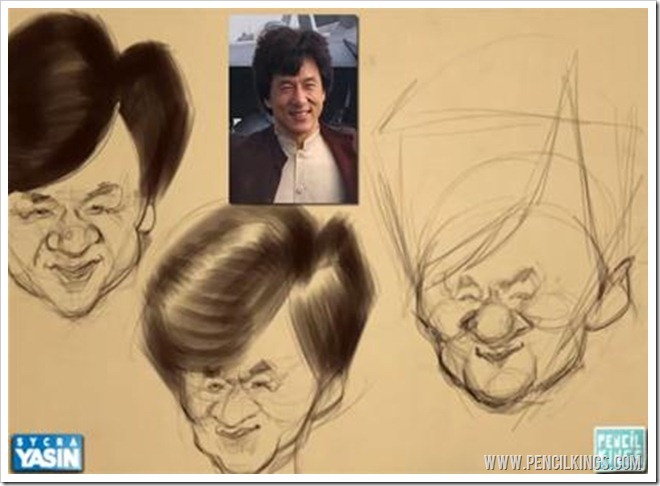 After some quick thumbnails of Ellen and Morgan, Sycra starts work on what will become his final caricature painting in this series – the famous Hollywood actor and martial arts expert, Jackie Chan. Notice how he starts off with a simple box shape for the head? 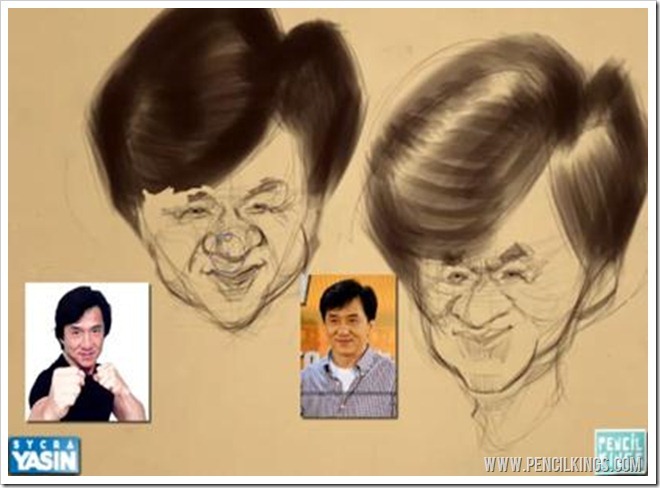 Getting the basic head shape right is a great place to start and will form a good basis for the rest of your caricature painting. You can use as many reference photos as you like, but when choosing them, be sure to select ones that actually look like your subject. We’ve all seen photos of ourselves and friends that don’t seem to capture what we really look like. It’s the same with celebrities, so take a good look around and only pick the pictures that really resemble who they are. 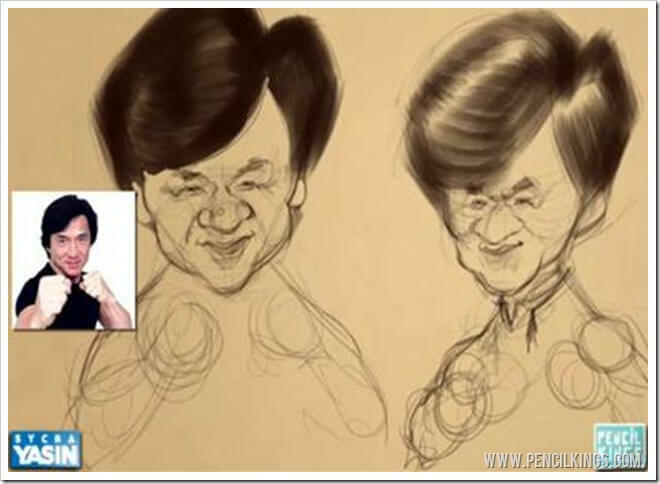 In this example, the picture on the right actually looks more like Jackie Chan, but the picture of him with his fists up is quite iconic and representative of how he appears. Therefore, by mixing and matching elements from different photos, you should be able to create a caricature that not only looks like your subject, but also captures their personality! You can even use images from other sources for features such as hands. For example, why not take a picture of your own hand if you can’t find the right pose in a picture of your chosen caricature subject? The more thumbnails you create, the more options you have for your caricature. 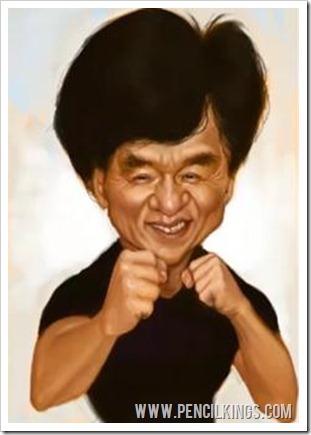 In this example, Sycra has taken another photo of Jackie Chan and experimented with the hairstyle to see which ideas work best. Once you’ve tried out lots of different ideas, you’ll then be able to focus on the one that best capture your subject’s personality. In the next lesson, Sycra will show you how to take your thumbnail sketches and develop your favourite one into a detailed, refined pencil sketch.